Passage Mounds: Form and Function. Passage Mounds: (Form and function). 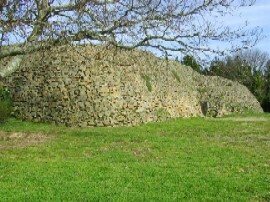 Passage mounds rank among the largest prehistoric structures left by the megalithic builders. 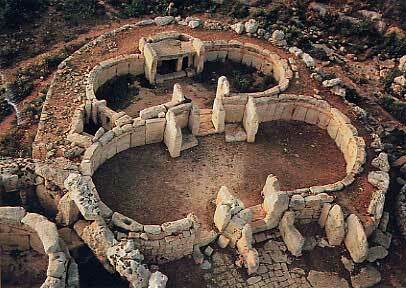 They are strongly associated with astronomy, and share constructional features with both dolmens and Pyramids. There are several substantial passage-mounds across western Europe, some of which can have only been built with the support of a large-scale organisation of skills, labour, materials etc. The fact that the majority of the largest European passage-mounds were built at the same period of prehistory (c. 3,500 - 3,000 BC), combined with similar construction principles, art, design and orientation of passages, leads one to look at the development of these structures at this particular period of prehistory as representing the result of an establish and structured society. Passage Mounds - Form and Function. By definition, a passage-mound is... 'A mound - with a passage in it...'. The passages of all the significant European mounds are invariably orientated so as to mark significant celestial events (such as the equinoxes, solstices, and lunar minor and major stand-stills), allowing light to enter the interior of the mound at fixed moments of the year only. Passage mounds are generally considered to have originated from the basic circle or henge monuments, such as at Brynn Celli Ddu, in Wales. 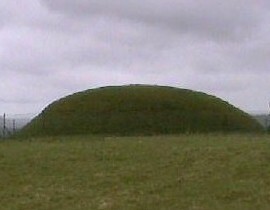 However, there are components in the design of the mound which can be seen in other megalithic structures. The principle of orientating a structure to allow sunlight to enter it at selected times of the year is echoed in the construction of Egyptian monuments. 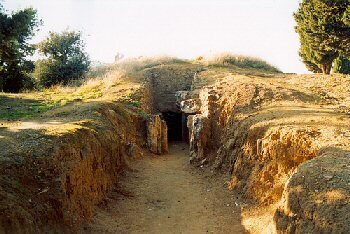 The internal masonry that composes the passage and chamber of European passage mounds also shares a strong similarity to that of dolmens, which themselves range from a simple dolmen (chamber) to a dolmen including a passage (Allee Couverte). 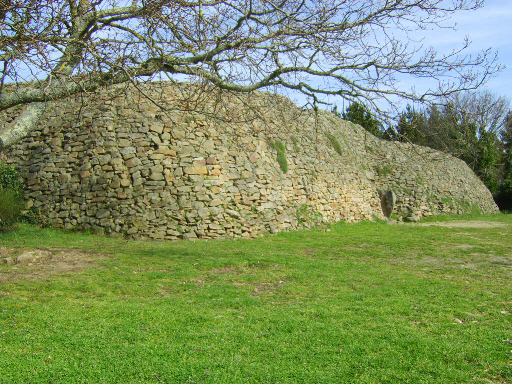 This picture is of the Zambujeiro passage-mound in Portugal, which has had a large part of the mound removed revealing the passage masonry, showing strong similarities with the Allees-couverte of France . 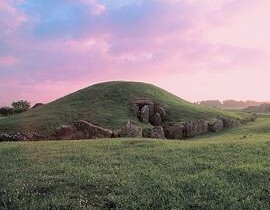 For a long time, passage-mounds, along with several other ancient structures, were assumed to be 'funerary' structures. For this reason, these structures were termed funerary mounds, passage graves etc, but human remains, when there were any have almost invariably revealed themselves to be from a secondary use. It is no longer possible to ignore the fact that there is also a strong astronomical influence in the design of the particular structures. 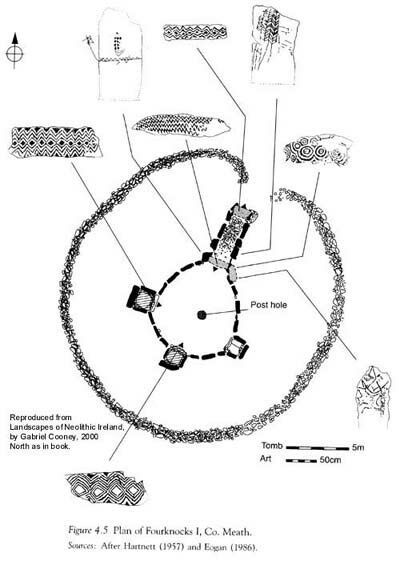 In the Boyne valley, Ireland - the passage-mounds and their surrounding structures have been shown to jointly offer an accurate means of calculating the most significant moments in both the lunar and solar cycles. The 'Mound of hostages' - on the Hill of Tara in Ireland is a legendary sacred site (The Sacred Heart of Ireland). Along with many other passage mounds, it is orientated to allow the passage of sunlight to 'penetrate' its body only once each year. 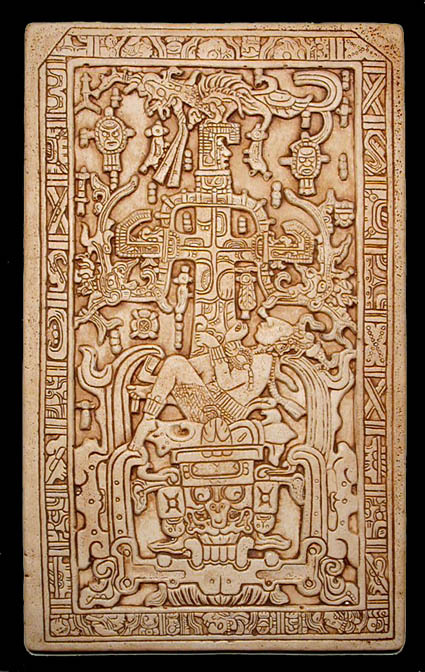 The connection between the female Earth-goddess and the male Solar-God is obvious. The Logistics of Passage mound Building. 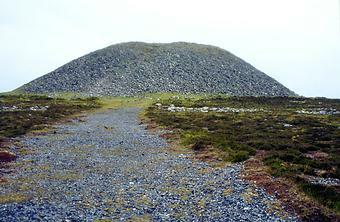 The earliest passage mounds are recorded in France, Ireland c. 4,700 - 4,600 BC. At this early period of time all the classic elements of the passage mound were already in place. 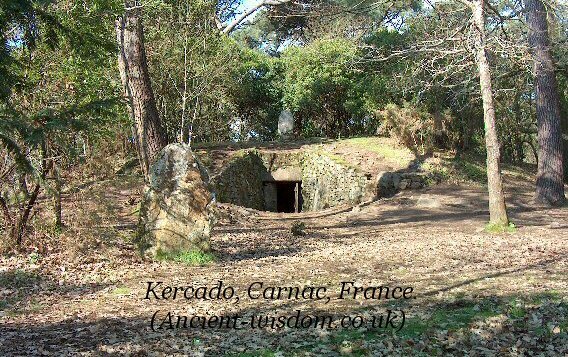 At Kercado in France, the passage mound was built orientated towards the midwinter sunrise (6), while in Ireland, they appeared only 100 years. 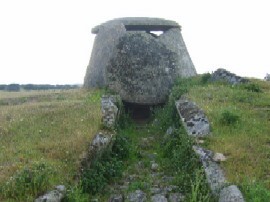 Recent research in France has revealed that several of the passage-mounds in the Carnac region were constructed around 3,300 BC, by people who used and absorbed the megaliths from existing monuments made by a previous megalithic culture (over a thousand years earlier), into the megalithic structures which we see today. Their early appearance in southern Europe and consequent re-introduction at 3,300 BC in France, Wales, and 3,200-3,000 BC in Ireland and Scotland offers a suggestion of coastal migration northwards. Passage-mounds and Stone Circles: The primal 'Mound of Creation'. There were several types of prehistoric 'mound' to be seen on the prehistoric landscape. 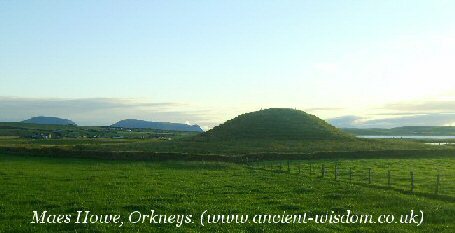 Many of them are simple 'cairn's' or 'barrow-mounds' and are solely associated with funerary rituals. However, there are also several other larger mounds which appear to have served other functions, including the observation of astronomical events. The numerous 'Beacon' Hill's in Britain have been mentioned above, and tradition and observation shows that they served the same function as passage-mounds but to a larger audience through the lighting of beacon fires in lines on hill tops across the open landscape. This too can be seen as a multi-functional act, both demonstrating a physical connection with the cycles of the cosmos through aligned landscape features, at the same time as connecting observers. The Boyne-valley passage mounds were each orientated so that the sunlight reached along the passages and into the central chambers at very specific moments of the solar and lunar cycles. In addition, The same is true of Maes-Howe on the Orkneys, Gavr'inis in France, Bryn-Celli-Ddu in Wales and Zambujeiro in Portugal. All of these passage mounds were constructed according to a set of basic astronomical requirements, which at the same time as enabling the builders to measure the solar and lunar cycles accurately, physically connected them to the beating heart of their universe. It is proposed that these mounds were a symbolic representation of the primal 'Mound of Creation', rising from a watery mythological past. The Maes Howe mound above is connected to the ceremonial landscape of the Orkneys through the close proximity of the Stennes circle, and within sight of that, the larger Brodgar circle, a combination which appears to have a common thread at several other western European megalithic complexes: (Avebury/Silbury Hill, Gavr'inis-Er-Lannic, Zambujeiro-Almendres, Ggantija/Xaghra). 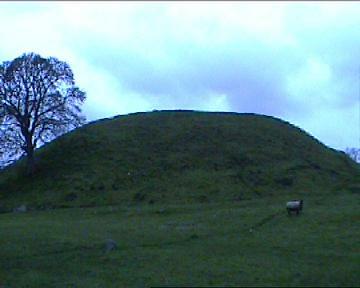 Regional variation on this theme has resulted in several combinations: In Ireland, Tara Hill shows the same features combined in the same ceremonial setting, only with the mound in the centre of the circle, Newgrange mound was built over an existing Stone circle, and Avebury has two circles built within it. This association of a prominent mound and associated circle/s can be seen to be one of the basic features of several of the (contemporary Neolithic) western-European ceremonial arenas. There are several other more specific similarities which suggest a contact along the Atlantic coastline of Europe between these civil-scale ritual complexes. While the outsides of many passage-mounds have suffered from the fancies of the restoration team, the insides have remained relatively untouched, and it is here that we find several structural and artistic similarities between the European passage-mounds. 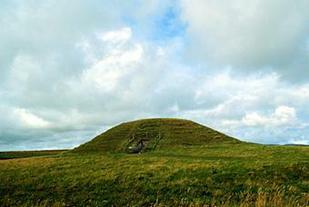 The following examples include some of the largest and well known passage mounds in Europe. 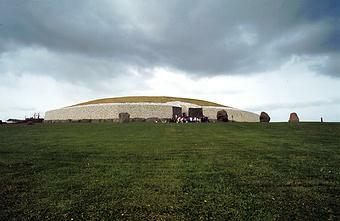 Raised internal chambers: Both the Newgrange and Gavr'inis passage-mounds have artificially raised internal chambers. In Newgrange, this elevation of the chamber reduces the entry of light into the central chamber as the following diagram illustrates. At Newgrange, the light-box is used along with other construction features (such as the passage narrowing and undulating along it length and a subtle increase in altitude towards the centre), which combine to focus the rays of the sun along the passage into a small, narrow beam of light, which is visible for only a few minutes on a few days around the winter solstice. As well as illustrating the astronomical nature of the structure, the inclusion of such a specific set of designs highlights the importance of accuracy to the builders. Light-Boxes are a construction feature specific to European passage-mounds. Maes Howe - Orkneys, (Winter solstice). 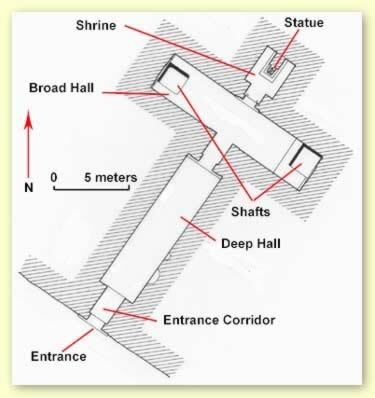 Newgrange, Knowth, Dowth, Fourknocks and Maes-Howe all have cruciform chambers inside (And the internal layout of the Maltese temples also show strong similarities). 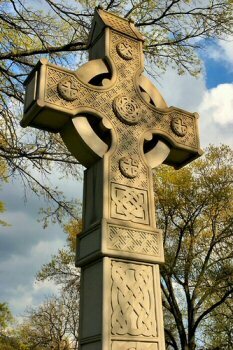 The exact function/purpose of the cruciform design is still unknown, but there are some common threads which may offer a clue as to their original purpose. European Cruciform chambers are frequently associated with astronomical orientation. They are distinguished by a long passage leading to a central chamber with a corbelled roof. 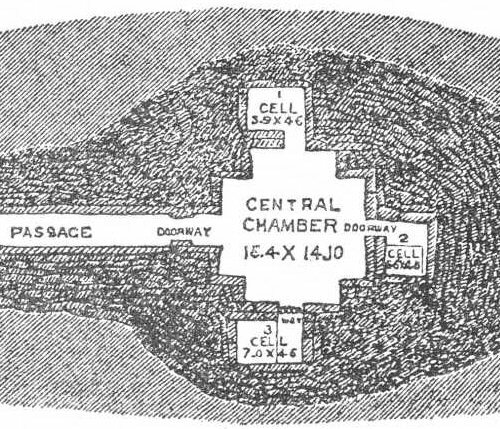 From this, burial chambers extend in three directions, giving the overall impression in plan of a cross shape layout. Some examples have further sub-chambers leading off the three original chambers. 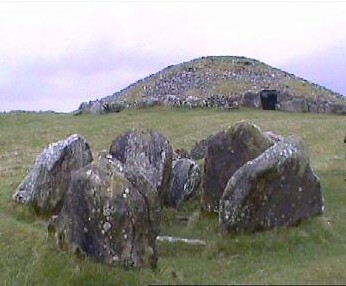 The network of chambers is covered by a cairn and lined outside with kerb-stones. A common trait is megalithic art carved into the stones of the chambers' walls and roofs. Abstract designs were favoured, especially spirals and zig-zags. Examples are Newgrange , Knowth, Dowth and Fourknocks (amongst many) in Ireland, Maes howe in Orkney, 'La Hougue Bie' on Jersey and Barclodiad-y-Gawres in Anglesey, and the Maltese temples. 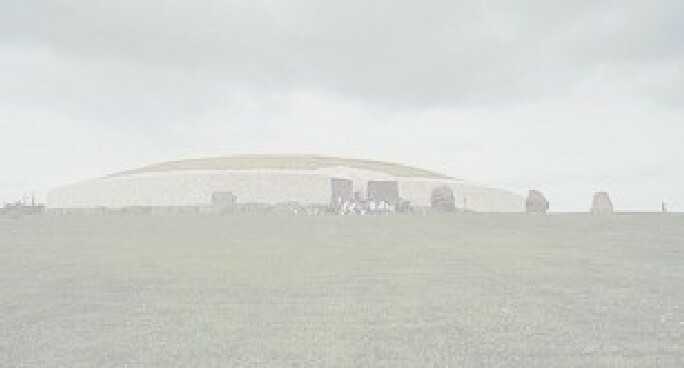 Newgrange (left), with three stone bowls, one in each recess, Maes Howe (right). 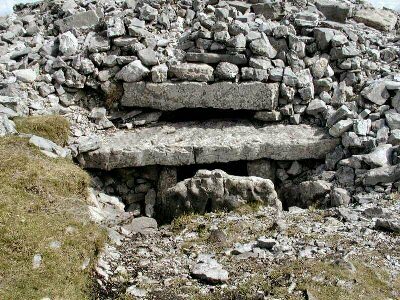 Fourknocks, Ireland, with cruciform chamber and 'crossed' lintel-stones. The tomb of Ahmoset (left); 'Fanbearer on the King's Right Hand', 'Steward of the Estate of Akhetaten' and 'Royal Scribe' at Akhetaten' during the Amarna Period, was also cruciform in shape. 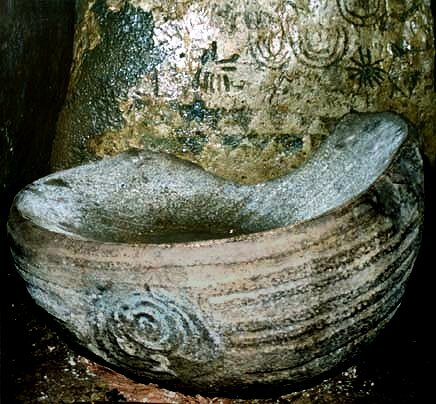 It is interesting to note that here too a bowl was present. 'The shrine opening from the very back of the broad hall on the center axis of the tomb was undecorated, though a seated statue of the tomb owner was cared at is back. However, this is now badly mutilated. 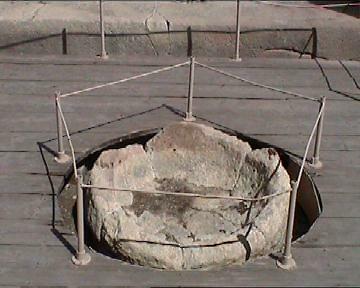 A libation basin was cut into the floor in front of the statue'. The same cruciform symbolism is seen around the ancient world, where it is often associated with the 'World-Tree' or the Sun. Palenque, Mexico (left), Celtic cross (right). The Maltese temples are believed to have been originally covered over, which would have rendered them with essentially the same exterior design as the other other European passage mounds. It has been noted that the cruciform chambers of several large, prominent passage mounds contain large, stone-cut 'offering'-bowls or 'libation-bowls'. Above left and right - Hal Tarxien, Malta. 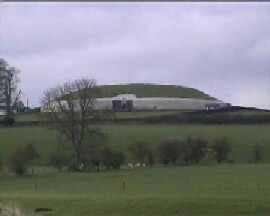 Knowth (left), Newgrange (centre) with one in each recess, and Dowth (right). 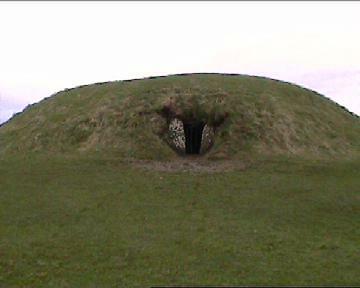 The bowls at the Boyne valley (above) were found to have funerary deposits in them, although it is not clear if that was what their original purpose was. 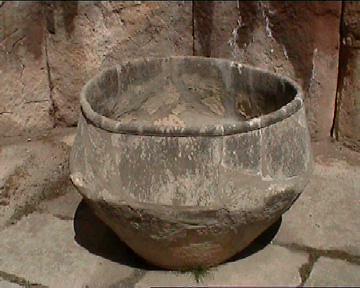 In the case of the Dowth bowl, it has been shown from its dimensions that the passage (and therefore the mound), had to have been built around it. 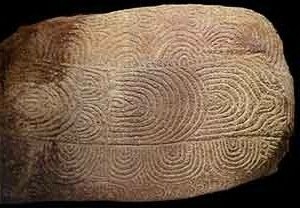 The engravings on both the Newgrange and Knowth bowls suggest that they are contemporary too. 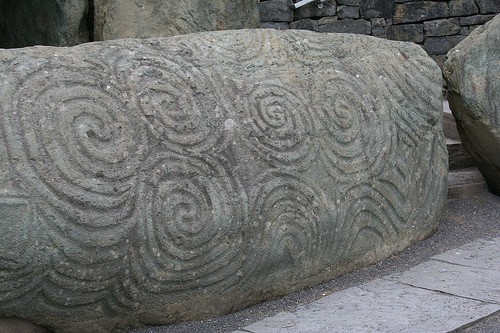 The Kerbstones from Newgrange K-52 (left) and Gavr'inis, France, right share several symbolic designs. 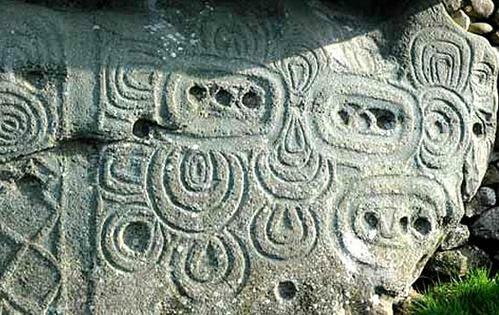 Stone SE4 at Knowth has a series of crescents running down the side, a design similar to that found on the rear stone inside Le Table des Marchands' passage mound, (nearby and contemporary with Gavr'inis). It has also been noted that there are several distinct similarities between the art of the Boyne Valley complex and the Orkneys complex as the following pictures illustrate. 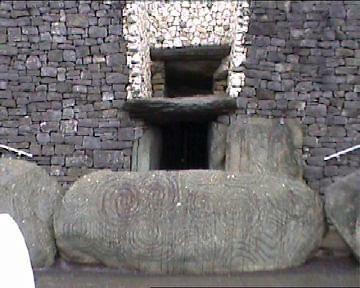 Newgrange kerbstone (left), and the 'Westray' stone, Orkneys (right). 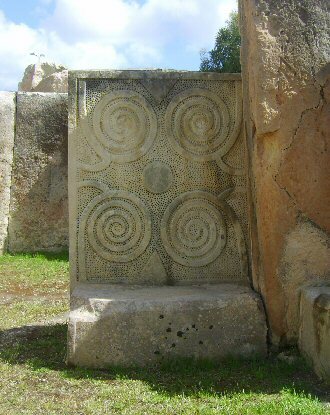 Similar Art can be seen on Malta. The contemporary images of the prehistoric Maltese temples show them as being covered over, which, when combined their internal cruciform design and the fact that they were generally orientated to the same moments of the year reveals a set of common themes with the western European passage-mounds. The following table supports the idea that there is an intimate relationship between passage-mounds and the astronomical orientation of their passages. Carrowkeel, Ireland (Cairn G). Summer solstice sun, Winter solstice moon. Dowth, Ireland Cross-quarter day sunset, and minor lunar standstill. Fourknocks, Ireland 17° east of true north (Unknown). 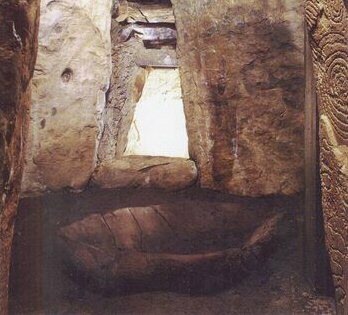 Knowth, Ireland. Lunar minor standstill, Equinoxial. Newgrange, Ireland Winter solstice sunrise. 'La Hougue Bie', Jersey. Equinoxes. Gavrinis, France Winter solstice sunrise. Brynn Celli Ddu, Wales Winter-solstice, Venus. Zambujeiro, Portugal Spring full moon 110° - Alignment to Xarez. Cueva de Menga, Spain. Passage mounds orientated towards nearby 'Head'. 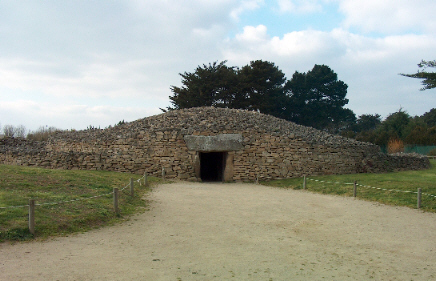 At 4,700 BC, The Kercado passage-mound is one of the earliest examples in Europe. It was carefully orientated towards the midwinter sunrise. 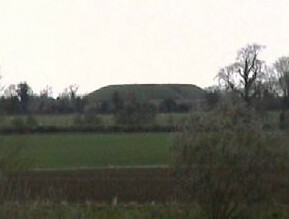 The passage mound structure varies from region to region, whilst maintaining similarities in design, construction, and art and presumably purpose. French Passage-mounds: Research in France has revealed more than one building phase of passage-mounds in the Carnac region. The Neolithic builders of 3,300 BC absorbed the monuments from an earlier megalithic culture into their own structures (from over a thousand years before). 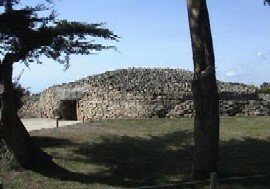 Kercado passage mound, Carnac, France. 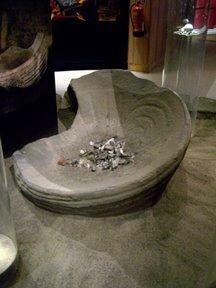 At 4,700 BC, this is one of the earliest in Europe. The capstones from Gavr'inis (left), Er-Grah, and La Table des Marchands (right), have all been shown to be parts of a earlier, single monolith. The construction phase for these passage mounds is dated at around 3,300 BC. The Irish passage mounds from the Boyne valley region, were built at around 3,200 BC (2), the same time as the French were building theirs. 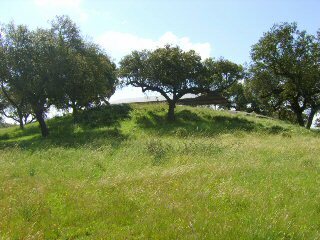 Portuguese passage-mounds: There are several passage mounds in Portugal ranging from full sized, 50m diameter mound of Zambujeiro to the more frequent but smaller mounds such as the Orca mounds by the Mondego river. 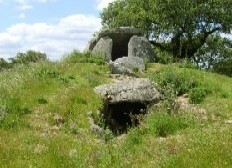 The Portuguese passage mounds present themselves as a unique hybrid of both dolmen and passage-mound, with several of them having never been fully covered. 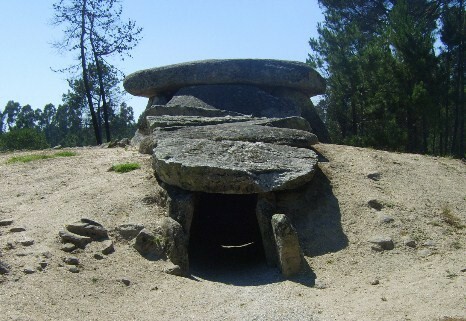 Although there are several different variations on the design of the Portuguese mounds, they have a style that remains unique to themselves which is that the stones supporting the capstones (invariably between 7 and 9), are placed with the front stones seemingly resting on the larger stones at the rear of the chamber. This style of construction is not seen elsewhere in northern Europe where the stones are placed upright independently of each other. Spanish Passage Mounds: Spain has several prominent passage mounds, including arguably the largest one in Europe. The Cueva de Menga complex include three substantial passage mounds. Cueva de Menga is considered to be one of the largest such structures in Europe. It is twenty-five metres deep, five metres wide and four metres high, and was built with thirty-two megaliths, the largest weighing about 180 tonnes. 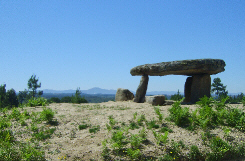 The entrance to the dolmen faces the anthropomorphic Pena de los Enamorados in the distance. Gallery of Passage Mounds: Quick Links. 1) M. Brennan. The Stones of Time. 1994. Inner Traditions. 2). C. O'Kelly. Newgrange, A concise Guide. 2003. Houston, Cork. 5). Michael Dames. The Silbury Treasure. The Great Goddess Rediscovered. 1976. Thames and Hudson.